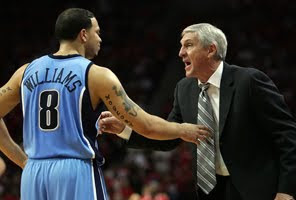 Game ball goes to: Deron Williams. He scored 28 points on 9 of 15 shooting, including 2 of 3 from behind the arc and 8 for 8 from the free throw line. He also dished out 13 assists, grabbed 3 rebounds, and had 1 steal. His otherwise outstanding performance was somewhat marred by 5 turnovers and an ill-advised foul on Chauncey Billups’ 3-point attempt at the end of the 3rd quarter. Still, he was primary reason this game was even close. Stat of the game: This was Jerry Sloan's 100th game coached against the Denver Nuggets. That’s well more than an entire season’s worth of games against one team! Highlight: Kyrylo Fesenko looked great in 11 minutes, hitting all 3 of his shot attempts, grabbing 2 rebounds, and playing solid defense. Though he didn’t record a block, he definitely altered a few shots. Lowlight: Although he had a hot hand during the preseason, Carlos Boozer was ice cold in Denver. He shot a dismal 3 for 14 from the field against the Nuggets and looked tentative most of the evening. Boozer was clearly bothered by the size and athleticism of Denver’s frontcourt, as most of his shots were high-arc fade-away jumpers. - Mehmet Okur was injured 24 seconds into the game trying to take a charge from Nene. After hurling a few jumbled expletives at the TV, I began to wonder what the Jazz had done to offend the injury gods. Fortunately Memo hobbled back out a few minutes later and went on to score 13 points in 31 minutes. He has mild knee and ankle sprains and is listed as questionable for Friday's home opener against the Clippers. - Andrei Kirilenko played a nice game and was active on both ends of the court. He had 16 points, 5 rebounds, 4 assists, and 1 block. The Jazz need this kind of effort from him consistently for them to be successful this season. 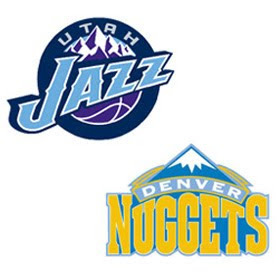 - Jazz rookie Eric Maynor was outclassed by Denver rookie Ty Lawson, who got to the hoop easily and scored 7 quick points during critical stretch to start the 4th quarter with Deron Williams on the bench. - This was the best I’ve ever seen Carmelo Anthony look. As much as I can’t stand him, he is turning into a superstar. - Utah’s two largest weaknesses were clearly exposed by Denver in this game: outside shooting and interior defense. The Nuggets took it to the hoop repeatedly against Okur, Boozer, and Millsap, who could do little to stop them. On the other end, Denver was contesting every Utah shot in the paint. I was actually surprised when I read the box score and saw the Nuggets only had 6 blocks. It felt more like 16.